Eric is so blessed by his tasty toast that he just has to say “thanks!” But who should he thank? Join Eric as he embarks upon an epic adventure of gratitude that takes him all the way to the giver of all good gifts! In this fun, rhyming storybook, children will learn to be grateful, giving thanks to God for all his blessings. Dai Hankey is a Welsh church-planting pastor who's also a DJ and rapper. Dai's first book for children uses his rapping gifts to create a fun, punchy story that young children will love to listen to. Combined with stunning new artwork by Xavier Bonet, Eric says thanks will quickly become a firm favourite with young children. Absolutely brilliant! I can’t wait to read it with my grandchildren! Children love repetition and rhyme. That's why they never tire of singing about those wheels on the bus going round and round. Dai Hankey's superb book on thankfulness to God keys into this. Its brilliant use of rap is sure to be a winner with the young. Whether you're a parent, a children's worker or a pastor wondering how to do something different for children in the service here is a great resource. The Lord instructs us to teach our kids “in the way”. Get comfy, open this book with your kids and together embark on a delightful journey of discovery. It all starts with a humble piece of toast as Eric traces his way along a fun, rhyming path of thankfulness all the way to our generous God, his word - and a timely invitation for us all to join Eric in thanking God for his many good gifts. I’ve got a feeling Eric could start something quite lovely in lots of little - and big - lives! "A delight to read aloud"
I bought this book along with Eric says Sorry and Eric says Please to read to my 3 year old grandson. He took in every word with big wide eyes. So simple, such fun and what a way to present the truth of God's Word. I have read them to my friends (middle aged), to many many elderly folks that I visit and I have bought extra copies for babies. The illustrations are fantastic and the rhyme and use of language are admirable. A sermon for all ages! There are three books in this Eric says series which are all in rhyme making it enjoyable for those reading and listening to the story! Eric says thanks, tells about Eric saying thanks for his toast and discovering how it’s made and those involved in the process and ultimately thanking God! My 2 year old son loves this book, and often asks for it. The combination of "where does stuff come from? ", great illustrations and a light hearted story are really good. The best thing is it ends in thanking God for everything. The end game and prayer also focus on thanking God for things we see around us and Jesus' death on the Cross. This is a superb book for encouraging young (and old!) to be thankful for the good things in life. The story follows young Eric, as he traces back the origins of his breakfast toast, meeting characters along the way, who all point him to the good provision of our Father God! Great for the family, school or church use! My kids love this - its a really excellent story that focuses their mind on God's provision. Bought this and Eric says Sorry. Both very good and the story brings Eric to the point of realising that God is who we need to thank. Loses a star purely because the colours of the illustrations are a bit grey. Do get brighter. 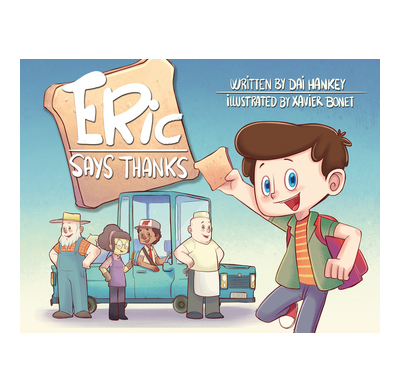 Congratulations Dai Hankey for two delightfully presented stories of little Eric learning the lessons of life that bring God's blessing. Please continue to produce more stories like this that appeal to all ages, even Grannies like me! This book is a short story in which a boy thinks about where his morning toast comes from. In fun rhyming prose he seeks to go back to say thanks to all those along the chain who have been responsible for his toast from the baker, to the miller, to the farmer who grew the grain. Finally, he ends up seeing that without the sun and rain there would have been no grain and as such his toast is ultimately a gift of God. This book is great way to help children see why they should thank God for their food and how ultimately he is the one who gives everything we eat. The book would be a particularly good read to help children connect a school harvest festival to God. The book is not explicitly evangelistic so does not go to Jesus but does provide a wider apologetic in that creation itself points to the existence and kindness of God. This is one of those books that young children are going to ask for again and again. Parents and children will find themselves quoting it off by heart, not because they intended to learn it, but because it’s written in rhyme. Primary school and Sunday school teachers will be able to use it in the classroom or for assemblies. It would be particularly useful at harvest time. You could even get the children acting it out. The size of book makes it very usable to read to a whole class. The pictures are fun, clear, and appropriate for infant-school children. It’s already joined the book corner at our church toddler group. I plan to use it for story time there in the autumn when we think about harvest, and point children and parents to our God who gives us all good gifts. I received this book free from the publisher in exchange for an honest review. What a lovely, fun , God centred book, I can't wait to give these out on our book sunday to the 5's and below. Beautifully illustrated, fun rhyming text and very heart warming.